Rifle scopes can be removed and disassembled for cleaning. 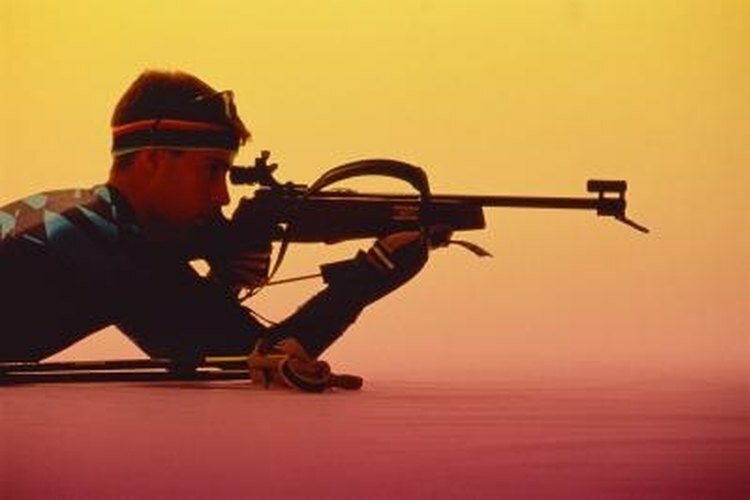 Rifle scopes are ocular enhancements -- for rifles, shotguns and pistols -- that allow the shooter to see targets close-up. A scope is essentially a monocular, magnifying a target several times its normal appearance to the human eye. These devices rely on a complex and sensitive series of mirrors and lenses. It's possible to knock these pieces out of alignment, affecting the accuracy of the scope. Place the rifle on a work bench, or other sturdy surface. Turn the rifle on its right side. Access the set screws on the base of the rifle's scope rings that attach the scope to the rifle. Insert a hex wrench into the set screws. Turn the screws counterclockwise -- one at a time -- until the scope ring pulls free from the mounting base. The scope detaches from the rifle once all the screws are removed. Turn the eye piece clockwise until it won't turn anymore. This returns the scope to its factory settings. Wipe both lenses with a micro-fiber cloth designed for cleaning sensitive optics. Use a circular motion to clear the lenses of dirt and other debris. Do not disassemble the scope beyond removing it from the rifle and adjusting the eyepiece. Doing so might damage the optics inside the scope.